I gave away all my VHS tapes when I moved in 2007. Haha. We don’ have any IKEA stores in Tasmania. If we get any flat pack furniture in our house it is my son, Adam, who assembles it. Despite my son having an intellectual disability (an IQ of 65) he seems to have no difficulty in following the instructions that come with the furniture whereas I, and my other sons, find the instructions frustrating. Maybe the instructions are easier for someone with concrete thinking, rather than abstract thinking, to understand? Or because he is more a visual learner than myself or his brothers? Here we go - sorry that it took so long. My camera broke and I had trouble repairing it. Ikea Ivar-cases (the highest ones) with the Pappis cardboard boxes. The boxes are laquered and colour-coded so that it's easier to find a particular book. May 20 and GNDN18 like this. wow because of the length or because of the chaos? 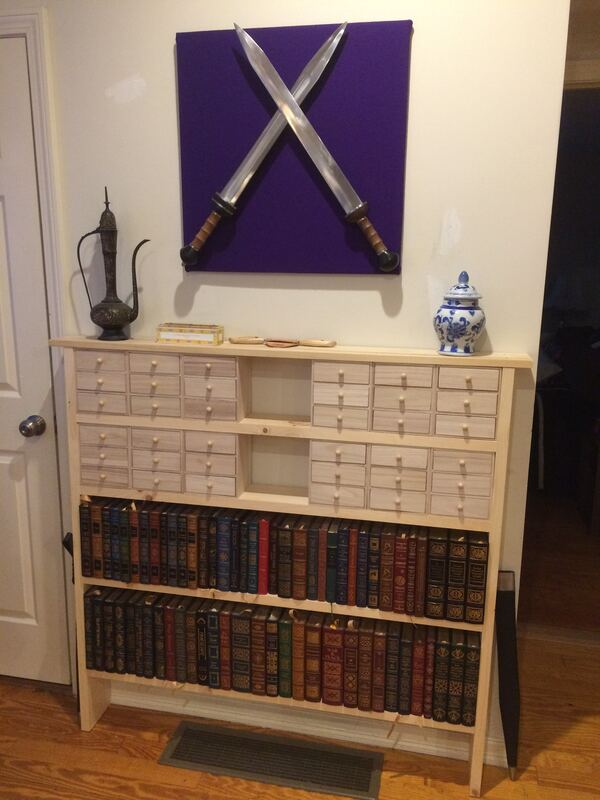 This case contains about 1/3 of my books. I started reading at 3 and instantly got hooked. My granny used to give me two books every week and I kept that up, though more often than not it's not just 2 books but more... Lately I've turned to ebooks and audioooks (white boxes) for a lack of space and the onset of presbyopia. To me, while a life without chocolate might be manageable, a life without books is totally unthinkable. It’s really cool; I like the color-coding quite a lot. If this is your idea of untidy, though, you have an almost naval-like notion of order. That is an absolute delight. Chaos? Untidiness? Heavens, no! I say this with the most good-hearted humor intended: is The Ark of the Covenant in there somewhere? I have the farsightedness, too. The lenses in my reading glasses are actually 25 years old, but are somehow still perfect for me after all this time. is The Ark of the Covenant in there somewhere? 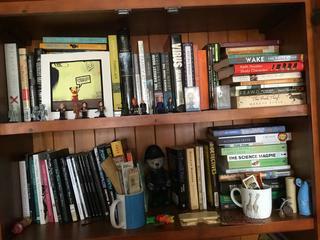 I'm rather untidy, usually, but I like to have order where it matters: among my books and on my harddrive. An additional factor is that recently my neighbours 3 cats developed the curiousity proverbial for their species and now frequently go on expeditions through my apartment if they discover the terrace door to be open. It's way easier to find them when there is not so much clatter. Not having to change glasses must be nice. I'm envious! The trouble is that I have been extremely nearsighted all my life and for a few years now am unable to switch focus from far to near anymore - typical for elderly people my doc tells me, shattering my inner image of being 20-something - so that I need normal glasses (for driving and walking), reading glasses for reading and cooking, and computer glasses at work. I also do a lot of needlework and since that's done at a shorter distance than reading, I had a special pair of glasses made for these extra-short distances (for darning socks, for example). Getting old is not so bad, most of the time, but it certainly is expensive! I do keep a good magnifying glass handy. More than an average number of the old wheat cents still seem to find their way to me in change at stores and I need that little boost to be able to make out the date and any mint mark. There was one actually waiting for me on the floor by the cart corral in Walmart a couple of weeks ago, lying wheat ears up, in plain sight. I was surprised. But it does seem like a lot of people don't notice their surroundings as much any more, in this cell-phone-obsessed age. I love all these fantastic book shelves! 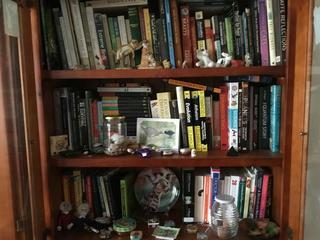 I am fortunate enough to be able to dedicate one of our bedrooms to being my library. 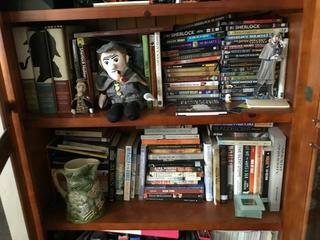 I have nine 7-ft tall bookshelves in there full of books running the entire gamut of fiction and non-fiction. *sigh* We did a huge purge when we moved two years ago, decluttering about a third of what I had then. Still, when we packed out, I had about 55 book boxes stuffed with books. That's not counting my kids' books. They have about four bookshelves each in their rooms; there's a bookshelf in the guest room, and another small bookshelf in my bedroom. My aunt told me that if one has at least 600 books, the collection can be declared a library. I don't know if that's true, but I have more books than that *on my Kindle*! I've never counted how many books we have, though. It's a lot. Miss Chicken, TrickyDickie and rhubarbodendron like this. 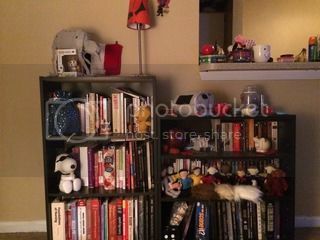 I have nine 7-ft tall bookshelves in there [...]That's not counting my kids' books. They have about four bookshelves each in their rooms; there's a bookshelf in the guest room, and another small bookshelf in my bedroom. May 20 and Kilana2 like this. Just saw this and it gives me ideas. cosmic mouse, Jinn, Timewalker and 4 others like this. I saw some other decorating show host babbling on about choosing books for their color, and thought it was incredibly shallow, but this... just wow. Standing them up straight would be a start. 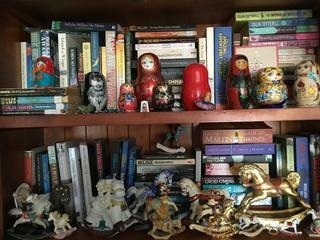 Some of the decorative items could serve as bookends. One shelf down, 24 shelves left to do. Arranging books by color drives me nuts. I have a housekeeper/organizer who comes here twice a month to help me with stuff, and on one occasion she and her wife put together some bookshelves I'd bought. That went fine (with copious swearing on their part, but they also said they didn't need my help, so I let them carry on). The part that didn't go fine was when they decided to be helpful and put the books on them. Who'd've thunk that all yellow-spined DAW books belong together, regardless of author, editor, series, or if it was an anthology or novel? Them: "Oh, I thought it looked better to have all the yellow ones together!" Me: "But they're all mixed up between the authors, editors, novels, and anthologies. And some authors and series have multiple publishers." They didn't like to hear that I had to reorganize all those yellow-spined books and add books with differently-colored spines because they went together in series. Even now, when things are getting more organized, I still get blank looks when I explain that yes, these books all belong together even though some of them look different. Same author, same series. So they stay together, no matter what it looks like. At least I didn't need to explain the difference between fiction and non-fiction to them, like I did a few years earlier in another book-sorting session. I've learned not to bother asking anyone to sort the Star Trek from the Doctor Who, because "it's all the same thing." And there's no point in asking to keep the science fiction separate from the historical novels. They don't get that, either. But so help me, I was flabbergasted beyond words, when a couple of college-educated 20-something girls, when I asked them if they could sort the fiction from the non-fiction, looked at me with confused expressions, and in all seriousness asked, "What's non-fiction"? At first I thought they were kidding. But they really didn't know. Wall to wall bookshelves would be great here, too. But whoever designed this building didn't do it with readers in mind. We're not allowed to put shelves on the walls, so I've ended up with quite the assortment of shelves. Some I had when I moved in, and others have been added over the years. It's still not enough. I need an extra room, and have wished that the space taken up by the balcony I never use could have been used instead to increase the size of the bedrooms or maybe a second storage room. Some knick-knacks are normal on shelves. I've got a lot of ACEO cards on display, as well as part of my rock collection and various penguins. Your non-fiction section contains mysteries and science fiction? My aunt told me that if one has at least 600 books, the collection can be declared a library. If so, then I've had a library since about 1980 or so. Hard to say, since I hadn't counted them very often. When I was taking French in college in 1982, the instructor asked how many books I had. I guessed about 500. The rest of the class gasped, and one person wondered if I'd made a mistake and meant to say 50. Turns out that I was off by at least 300. I counted them a couple of days later and discovered I had about 850, give or take a few. How many there are now... I've honestly no idea. The goal is to get everything sorted, and shelf space found for what I'm keeping. One of the shelves I have is stuffed full of Star Trek, Robin of Sherwood, Darkover, Highlander, and Doctor Who fanzines. That's one reason I don't care much about the pro novels anymore. I've got Star Trek fanfic spanning 30 years to read, plus more recent stuff from the Highlander series. I'd need a very large fleet of ships for all my Star Trek books! cosmic mouse, GNDN18, Timewalker and 1 other person like this. GNDN18, May 20 and Kilana2 like this. cosmic mouse, GNDN18, Timewalker and 2 others like this. When I was taking French in college in 1982, the instructor asked how many books I had. I guessed about 500.